I found the perfect blueberry muffin recipe a while ago but could not resist the idea of a blueberry muffin with passion fruit – these are delicious and the flavors go wonderfully well together, but next time I would simply add passion fruit pulp to Flo Braker’s recipe – those were better flavor and texture wise. Preheat the oven to 180°C/350°F. Generously butter eight cavities of a 1/3-cup (80ml) capacity muffin pan – fill the empty cavities halfway through with water. In a large bowl, combine flour, baking powder, cinnamon, salt and sugar. In a small bowl, whisk together the sour cream, butter, lemon zest, egg, vanilla and passion fruit pulp. Add the sour cream mixture to the dry ingredients and mix with a fork just until combined – do not overmix or your muffins will be tough. Add the blueberries, mix lightly, then divide batter among prepared pan – they should be ¾ full. Bake for 20 minutes or until golden and risen and a skewer inserted in the center of a muffin comes out clean. Cool in the pan, over a wire rack, for 10 minutes, then carefully unmold. Transfer to the rack. Serve warm or at room temperature. thank you for the recipe, I keep it for summertime ! Wat a super tempting and marvellous muffins. Anne is way to sweet to be a true catwoman! Passion fruit is new to me. I'd love to give it a try! I love the polka dot liners, adorable! 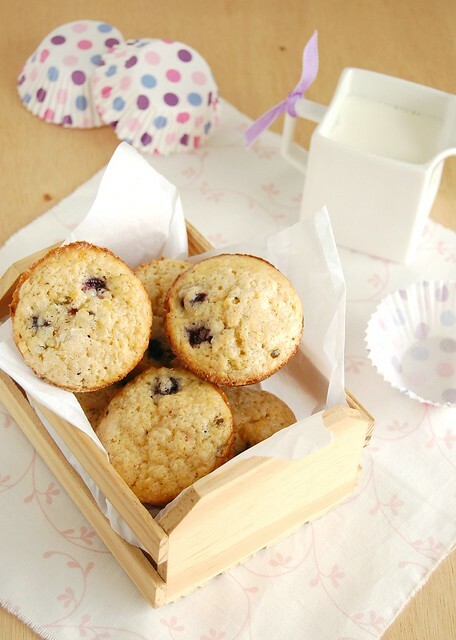 Muffins adorables me encantan los blueberry lucen perfectos,abrazos hugs,hugs. Very nice recipe but my muffins were tiny - next time I'll make a bigger batter to make 12 slightly bigger ones. Anyway, they taste great so that's the main thing - thanks for the recipe! Hey, Anonymous - I'm glad to hear you liked the muffins!